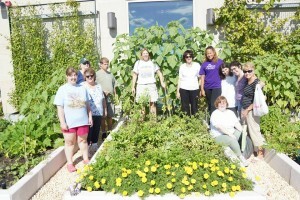 Middletown Garden Club members with MARC staff and consumers! English Poet Alfred Austin sums it up beautifully; with spring 2 weeks behind schedule this year, the excitement to get working on CHC’s rooftop gardens was building. This week we started the 3rd season of community garden plots in the newer “Peace & Health” Middletown facility of Community Health Center, Inc. Starting small in 2012, this planting collaboration has evolved into an intimate partnership of learning, sharing and growing…lots of growing! With the dedication and knowledge from Middletown Garden Club and enthusiasm from the MARC: Community Resources organization’s leaders and consumers, the opportunity to host a community garden club was made achievable with endless opportunities! This week was used to prep the garden beds after a long winter and I was also lucky enough to host a planting lesson for the 3rd-5th grade classes at Macdonough Elementary School on Tuesday. The theme of celebrating spring and motivating some young gardeners with a few basic instructions was way too much fun. Thanks to CHC and Alex, an awesome work study student from Wesleyan, we were able to have over 90 student’s plant and take home a seed. Macdonough pupils have spent time planting on our roof over the past few years and we’re preparing for student trips over the next few weeks and during summer school. Since spring was a bit tardy this year, we used this first week to weed, turn over the garlic we added in the fall (some of us learned that it’s best to plant garlic cloves before winter), and spread organic fertilizer into the soil of each bed. Day 1 started with bagels, coffee and friendly chatter amongst returning and new friends while the experts mapped out the seed locations in each of the 6 plots. The national service members here at CHC are also a huge piece to this puzzle and will be joining the effort and learning what it’s all about. Three members participated in the first day and it was much appreciated. This Tuesday, (May 6) is the first official day for the MARC consumers and we will be adding a variety of seeds and getting our hands dirty as a group. Various types of fruits and vegetables, flowers and herbs will be added over the next few months into the beds. Aside from the technical details of growing and maintaining a garden, the atmosphere created when a variety of personalities come together to make something grow is quite the experience. The MARC group supports young adults with developmental disabilities and started coming last spring, each week to CHC as a part of their seasonal program. It’s a known fact that when I come to greet the amazing woman from Middletown Garden Club along with the MARC members at 3:45pm on Tuesdays during our garden season, something internally amazing happens. All life and work qualms are instantly removed, smiles are abundant and everyone is gaining some type of insight. Whether you learn how to stake a tomato plant properly, face your fear of heights up on the roof, practice patience with weeding or become more familiar with the concept of “rooftop gardening”, it’s always enlightening for any individual. I wanted to write a short post not only announcing the start of CHC’s gardening season but to recognize the many people who help make it happen. The rooftop was created to promote health and wellness along with a sense of growth and I believe that is a major component to our gardening group. Craig Rosenberg, a senior facilities tech at CHC has supported the garden efforts since the building opened three years ago. Without him, we would be lost. The volunteers from the Middletown Garden Club cannot be thanked enough and the simple act of MARC choosing to host a program at CHC is a huge compliment and we’re grateful for their efforts. The time has come to get outside, soak up the vitamin D and plant something…anything you want, just wait until you see and feel the benefits of watching something transition from seed to plant, its life changing.